Frontier Airlines has arrived at Wichita Eisenhower National Airport bringing low fares to Denver. Frontier was warmly greeted with a water cannon salute and cheers, clapping, and horn blowing from a full flight of passengers ready to take Frontier’s first flight to Denver. Frontier Airlines’ arrival to Wichita Eisenhower National Airport with low-fare service to Denver could not come soon enough. Frontier served the Wichita market from October 2007 to November 2012. Due to the economic downturn and a decrease in travel around the nation, Frontier exited ICT and eventually was bought by Republic Airlines and then by Indigo Partners, a venture capital firm. Since Frontier discontinued service in Nov. 2012, average fares to Denver have increased 109% and passengers to Denver have decreased 54% (Q4 2012 – Q4 2017). Denver went from our 3rd top destination in 2012 to our 13th top destination in 2017. Capacity to Denver (number of seats) has decreased 49% (through Q2 2018). This is a $652 difference. Frontier is now an ultra low-cost carrier, which means they offer discounted fares, unbundled fees, and flies three times a week instead of daily. 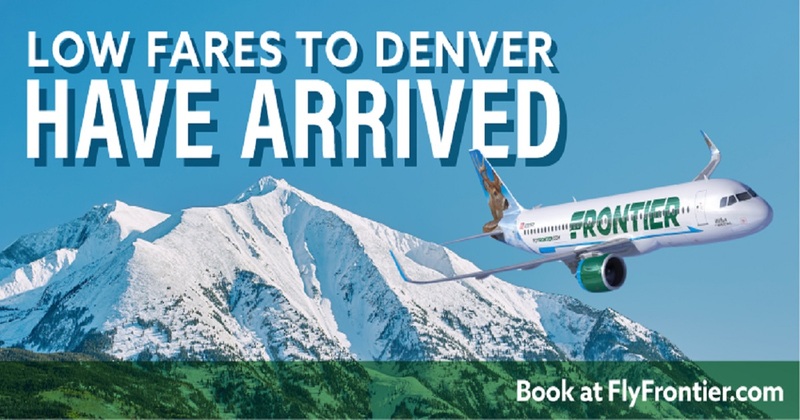 Frontier brings much needed competition to the Denver route. As a result, United is increasing seats by 15% and adding a second narrow-body aircraft in October. United’s midweek fares have decreased; instead of $815, their fares are advertised at $549 (round-trip). Those fares, of course, change often. Flights will operate on Tuesdays, Thursdays and Sundays using an Airbus A320. Frontier is expanding rapidly and now serves 100 markets. If our market strongly supports them, they will likely add more low-fare destinations. Learn more about Frontier’s programs and book your flight at www.flyfrontier.com.